Disney’s take on Hans Christian Andersen’s “The Snow Queen” is a tuneful, entertaining, great looking animated feature that will capture the hearts of young kids and adult movie buffs alike (that would be me). All the classic Disney ingredients are here: a heroine we can root for, an unlikely hero who has to prove himself, a colorful array of supporting characters, eye popping production design and an unforgettable musical score by Kristen Anderson-Lopez and Robert Lopez. Writer-directors Jennifer Lee and Chris Buck have managed to strike a balance between traditional and modern storytelling. The story of how two royal sisters were forced to live separate lives after it’s discovered that Elsa, the future queen, has the ability to turn everything she touches into ice couldn’t be more simple. But the way it looks and feels onscreen is what elevates it above Disney’s most recent films. Best of all, it never stops moving which means there’s never a dull moment. The voice work is first-rate, with special kudos to Josh Grad, who adds zest to the role of Olaf the snowman. 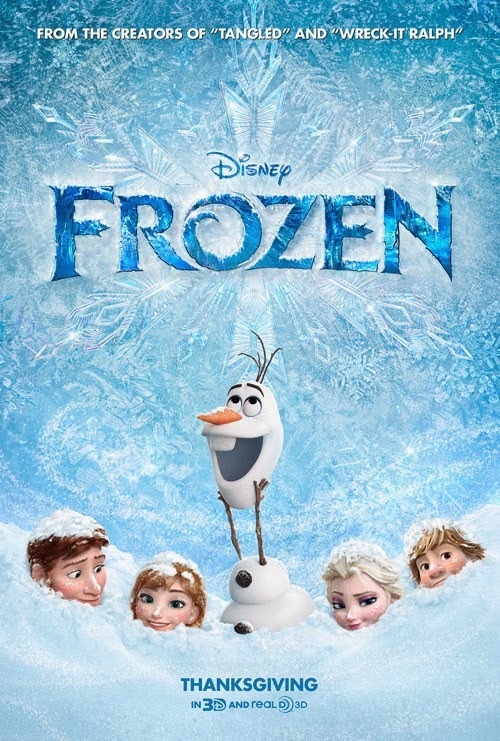 “Frozen” represents the work of some of the finest character animators alive, along with a team of talented artists. It’s Disney’s best animated feature in years. Bolt, The Princess and the Frog, Tangled, Winnie the Pooh, Wreck-It Ralph and now Frozen. Walt Disney animation studio is on a WIN streak (mainly due to John Lasseter being the CEO).